Sometimes you just don’t grow up. It might be apparent, and not happen very often, but on occasion you are catapulted back into being a child and laughing uproariously and uncontrollably at stuff you haven’t laughed at since you were maybe four or five. You discover that your puerile sense of humour you were sure was long gone was actually only dormant, not dead. And so it was when I discovered Barf. I must have been walking down one of Kabul’s main drags when I saw a window full of it. 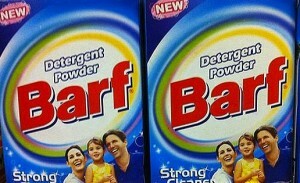 There, stacked high, were boxes emblazoned with the huge English language font spelling out the word B-A-R-F. But it wasn’t matter prematurely expulsed, to quote an urban dictionary, it is the name of one of Afghanistan a leading washing detergent, and so labelled because it means snow, which still brings a smile to my face.